Portland Stage, located in Portland, Maine, offers vital theater arts education to learners ages 4-18 through our In-Theater and In-School programming. All classes and workshops are taught by professionally trained Teaching Artists and focus on literacy, cultural awareness, collaborative play, and creative thinking. Our teaching philosophy highlights process over product, deepening students’ ability to analyze, synthesize, and think critically while making connections to the thoughts and ideas behind the written word. This is one of a series of 6 blog posts outlining who we are and what we do, brought to you by Hannah Cordes, Education Manager, and Julianne Shea, Education Administrator. These posts will appear September 27 through November 1, 2017, on Wednesday’s. One of our exciting In-School programs is called Directors Lab. Directors Lab engages middle and high school students with Shakespeare through performance, workshops, and active text-work. This year, we will be performing a 45 minute version of Shakespeare’s Julius Caesar followed by a talkback with the actors and exciting hands-on workshops in classrooms. Directors Lab puts Shakespeare’s language into the hands and mouths of the students, empowering them to be the artists, directors, and ensemble with the power to interpret the text and produce meaning. On a personal note, this is my absolute favorite program to teach and engage with. As the director of the touring production, I get the privilege to be in the room with our fantastic actors as we explore the text and characters of Shakespeare’s plays. We put on the production with only four actors, so a large part of the rehearsal process is problem-solving, brainstorming, and playful experimentation. How do we show which character you are playing in any given moment? How do we fill in the gaps that a 45-minute adaptation poses us with? How do we bring this story alive in an engaging way? Rehearsal is an action-packed week of collaboration, laughter, tears, and joy that makes bringing it to schools all the more exciting and valuable. The final and most important part of the equation is the students! It is remarkable to watch students bring Shakespeare’s language alive using their own experiences and emotions as the backdrop for approaching the text. I rediscover Shakespeare’s plays each time I step into a classroom, as the students introduce new ideas and layers to these stories. Students make for the best audiences because they have less social restrictions as spectators. They organically respond to what is occurring on stage, which makes for a transformative 45 minutes. During a performance of Romeo and Juliet, the woman playing Juliet asked the nurse “Shall I speak ill of him that is my husband?” and the crowd of students erupted with an “OHHHHH!”. The students’ response was because they knew that this was a huge moment for Juliet’s character and an important reveal. Clearly, they were following the story and invested in the characters’ journeys. The energy in the cafeteria, gym, theater, or wherever else we perform is electric and like nothing else I have ever experienced. One of the first activities that we do in the workshops is called “text layups” (an activity created by the education team at Shakespeare & Company) where each student performs a single line of text. Another student stands behind the performer and reads the line from a piece of paper. That way, the actor is not reading and trying to comprehend or “get it right”. Their job is simply to listen to the line, repeat it, and bring the text alive, whether through an emotion, a gesture, a tone of voice, or a combination of all of the above. At a school visit last season, one student got up and completely froze. He had wanted to try to say the line out loud but once he was faced with the moment, he couldn’t bring himself to speak. I went up to him and asked him to say the line just to me so that he would have an experience of speaking the words without worrying about an “audience”. He looked me right in the eye and spoke the line of text with emotional clarity and power and I was incredibly moved by his performance. He continued to participate throughout the workshop, playing a witch in our exploration of the “double, double” text and making brave acting choices throughout. At the end of each workshop, every student reinforces one thing from the workshop and many students reinforced the boy for his bravery. He was beaming by the time he left the room. After all the students were gone, the teacher came up to me and told me that student not only never speaks in class, but he also had never made eye contact with a fellow classmate or a teacher before. This is just one of many moments we have experienced in this program that sheds some light on the extraordinary power of theater and Shakespeare. I could talk about this program for pages, so instead I will end with some quotes from teachers that I believe sum up the magic of this work. “The students loved the post-performance workshops. 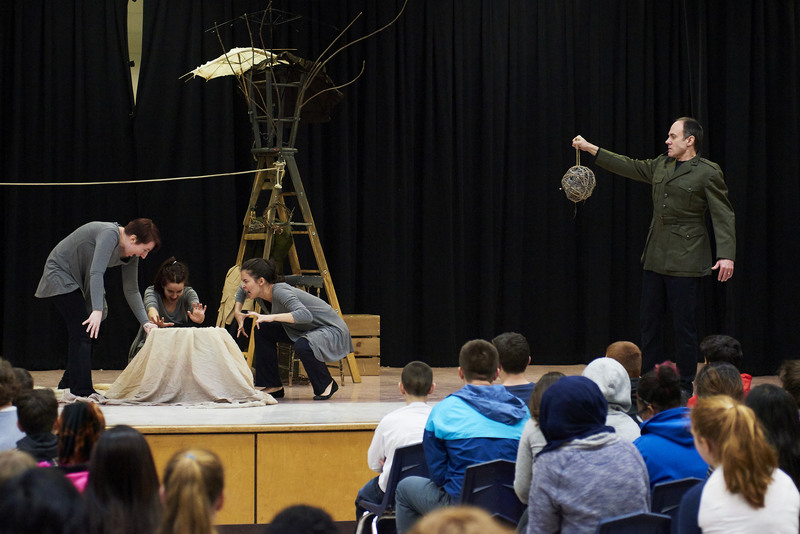 They were a wonderful way to capitalize on the performance and appreciate Shakespeare’s craft in fun new ways…In short, [the students] got thoroughly engaged and involved in your wonderful post-performance program. I am already working on obtaining the necessary funding to have you back next year–no matter what play it is. That’s how highly all the 11th grade teachers thought of your efforts.” – Rich Westley, English teacher at Scarborough High School. Interested in learning more about this program? Email education@portlandstage.org or call 207-774-1043 ext. 104. You are currently browsing the me arts ed blog archives for the day Tuesday, October 3rd, 2017.